Hope you all had a fun weekend. It’s Monday and time for another animation from your choice of still images. Thanks to Carla/Lady Cassia for today’s screencaps of Richard Armitage as Sir Guy of Gisborne from Robin Hood 1.4. On the DVD commentary, Richard Armitage said, “That was my Debbie McGee moment to his (Keith Allen’s) Paul Daniels.” Since I’m not British, I looked up those names and they are a husband and wife magic act, LOL! To me, however, in that scene Guy looked like a game show host. 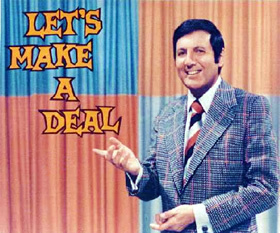 Here in the States, a popular and long-running game show is Let’s Make a Deal. Are you familiar with that program? Below is your Flash banner. Please click the image or text link. Hope you enjoy the animation. Thanks again to Carla/Lady Cassia for your input. 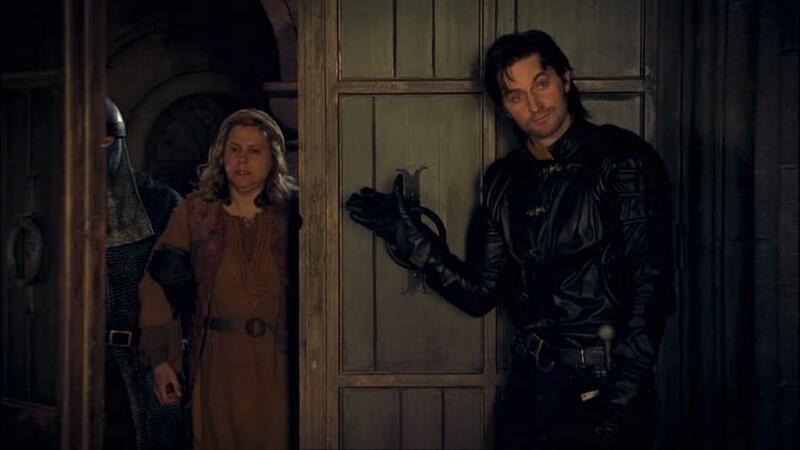 This entry was posted in Flash, richard armitage and tagged actor, game show, guy of gisborne, let's make a deal, monty hall, richard armitage, richardarmitagenet, richardarmitagenet.com, richardarmitagenetdotcom, robin hood. Bookmark the permalink. Bravo Bccmee for the animations ! @April: So happy you enjoyed this animation! Ha love it!! Great choice Carla. Come on down Bccmee, another winner from you! @mersguy: Aw thanks! Delighted you liked this little bit of silliness! More of Guy! Thank you Carla. Bccmee I love your work too because you don’t hesitate to play with Richard. I think your sense of humour would please him. I didn’t know his comment about the scene , it’s very funny. Very welldone Bccmee! In this pic he could seems to be a weather forecaster too , isn’t it? You’re so right about the weather forecaster; I hadn’t thought of that! I’m always worshipping the distressed Sir G. S3. For once I wanted a fluffy version of him, that’s the reason why I chose these screencaps. I almost collapsed from my chair for laughing. Yes, Sir G. looks exactly like a TV entertainer in this tragicomic scene of season 1 (“Parenthood”, correct?). @Carla: You gave us some great and fun screencaps, thanks again! 😀 Yes, this was the “Parent Hood” episode. I´ve never heard about this game show, Bccmee, but I agree with you: in this scene Guy would play a game show host. Or a weather forecaster, as Lady Prisca said. Many good ideas! @Thais: Yes, Guy has such a funny expression as he makes that gesture. This must have been a fun scene to shoot! Hilarious! The Price is Right! @fitzg: The possibilities are endless! Bcc, thanks again for these priceless moments!!! @Luciana: Every contestant would want the host and not the prize behind the curtain, LOL! The game show where you’re always the winner! I know Let’s Make a Deal well! If Richard was the host I would be watching it every day. Love it Bccmee and Thank you Carla for a great choice. @Musa/Fabo: We could have a group watch every day, LOL! Great picture choice, Carla! I’ve never thought about it before, but he does look like a game show host in this pic, lol! Great banner bccmee. Great minds think alike because I also saw the game show–Door #3, Ha!–potential of this pix when he reveals the mother. Ha! I was going to use the pix in an F3 CRAzying Captioning post, but I’ll choose something else. Hmmm. So many Sir Guy pictures to gaze upon and so little time. Ha! But it is a sublime “task”. Giggles. @Gratiana Lovelace: Ah yes, when this picture was submitted my first thought was the game show connection. We do think alike a lot! *HUGS* 🙂 I am looking forward to your FanstRAvaganza posts! Very funny!!! Thank Bccmee and Carla! And behind door number 3 is….HAHA, he does look like a game show host! Love it! Just caught up with this month’s graphics fun! I love them all, each one is so creative and I love the fact that you put a different touch in every day! Well done love, your work is brill! @yelloweee: Thanks for your generous and thoughtful comment! I really appreciate your words of support! @Holliday: Absolutely! We would all be winners if we could, LOL! I know neither Debbie McGee&Paul Daniels nor “Let’s Make a Deal” but still the scene was funny enough! Love this one. Gave me a good chuckle… game show host, indeed.